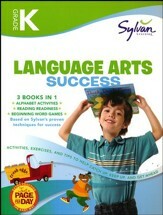 Sylvan's Language Arts Success workbook features three books in one! Alphabet Activities, Reading Readiness and Beginning Word Games will together help students learn about upper and lower-case letters, consonant sounds, beginning sounds, colors, story characters, story sequence, and more. 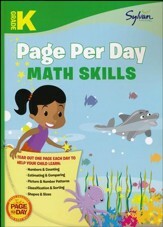 309 non-reproducible, full-color pages, consumable workbook, softcover. Answer key included. 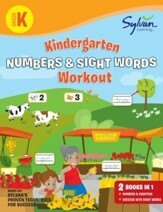 Kindergarten / Grade K.
Familiarize children with grammar and beginning sounds with Sylvan Learning's full-color workbook. Children will learn about consonant sounds, short vowel sounds, story settings, and story sequences through simple activities. 64 pages, softcover. 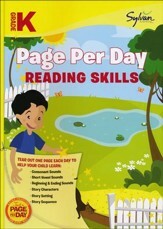 Grade K.
Help your student develop their spelling skills with Sylvan's Spelling Flashcards. 230 selected words (and 10 blank cards for customized words) will help prepare kids for school and phonics success. The front of the card features a word missing some or all letters with a supporting illustration. The back provides the spelling of the whole word & the concept being reviewed. Leveled for difficulty, the tabbed card and color-coded mastery meter along the side of the box will help you keep track of which words students have mastered and which could use more work. Rounded corners. Non-laminated paperweight cardstock. Grade K/kindergarten.